Utilizing spiritual-scientific research methods, Jesaiah Ben-Aharon gives an astonishing first-hand testimony of Rudolf Steiner's declarations regarding the new Christ Revelation, and offers his own findings on the Spiritual Event of the Twentieth Century. Based on occult Imaginative consciousness, he gives a unique account of events which took place in the spiritual world during the war and turmoil on earth in the period 1933-45. His words have a particular significance for an understanding of the work of the grouping of souls which the seer and spiritual teacher Rudolf Steiner called the 'Michael School'. Through coming to a fully conscious comprehension of the Spiritual Event of the Twentieth Century, the author asserts, we may gain the courage needed to renew and enliven the spiritual science of Anthroposophy as 'the universal human language of our age'. This second edition features an extensive introductory essay. 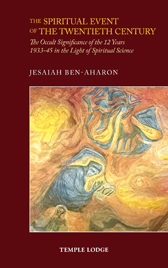 DR JESAIAH BEN-AHARON was born in Israel in 1955. He received his Ph.D. on the phenomenology of Edmund Husserl in 1998 from Haifa University. He is the co-founder of Global Network for Threefolding (GN3), Activists for Israeli Civil Society (ICS), a School for Spiritual Science, and the author of The New Experience of the Supersensible. He is also a co-founder of Kibbutz Harduf (1980) where he lives with his wife Adira and their daughter and son.